"I live in Buckeye country, that's the land of Ohio State University football to the rest of you. We love to tailgate and watch the Bowl games, and are always trying to come up with clever things to do to our biggest rivals up north, the Michigan Wolverines. The cherries and maple in this wonderful salad inspired the name. Enjoy!" In the container of a blender, combine the mayonnaise, maple syrup, vinegar, and sugar. Cover and blend on low speed. Gradually pour in the vegetable oil while mixing until fully incorporated. Taste and season accordingly with salt and pepper. Set aside. 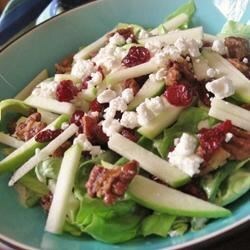 In a large serving bowl, combine the lettuce, cherries, apples, goat cheese and candied pecans. Toss with just enough of the dressing to coat, then serve with the remaining dressing on the side.